Botchwey, G, Crawford, G, Loubere, N and Lu, J (2018) South-South labour migration and the impact of the informal China-Ghana gold rush 2008–13, WIDER Working Paper 16/2018, UNU-WIDER 2018. Read more about Botchwey, G, Crawford, G, Loubere, N and Lu, J (2018) South-South labour migration and the impact of the informal China-Ghana gold rush 2008–13, WIDER Working Paper 16/2018, UNU-WIDER 2018. A three-day workshop was organised for the library staff of the College of Technology Education, Kumasi (COLTEK) of the University of Education, Winneba from July 3rd to Friday, 5th July, 2018. It was aimed at enhancing the skills of the library staff in various components of Information Literacy so that Librarians would be able to provide better services to their users and also assist them to become information literate. Fresh Sandwich students are to take note of the 2-day Medical Examination scheduled to commence on Friday, 27th July, 2018 at the University Clinic. The exercise will be done on first-come, first-serve basis for the first 150 students. Please take note and act accordingly. U.S. Fulbright Scholar, Prof. Tiece Ruffin has on behalf of her family, donated a collection of twenty books to the Special Education Department of University of Education, Winneba (UEW). This special collection of children's literature features children with a variety of disabilities like dyslexia, autism, Down syndrome, learning disability, blindness and deafness amongst others. The donation was done at the Special Education Reading Resource Centre at the South Campus on Tuesday, 24th July, 2018. JOPHUS ANAMUAH-MENSAH CONFERENCE CENTRE - Undergraduate Students. SOUTH ASSEMBLY HALL - Postgraduate Students. The 2019-2023 Corporate Strategic Plan Development Committee of the University of Education, Winneba (UEW) has organised a ‘Strategic Planning Sensitisation’ workshop for staff of the University. The 2014-2018 Corporate Strategic Plan of UEW ends in December, 2018; thus, to fill the vacuum within that period, the Management of UEW constituted a Strategic Plan Development Committee (SPDC) to develop a new Strategic Plan for the next five years (2019-2023). 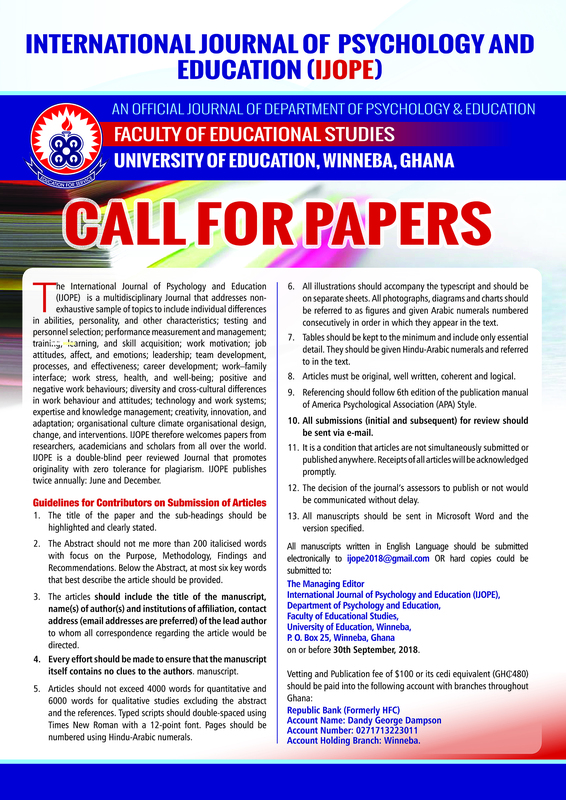 The University of Education, Winneba is pleased to announce the list of successful applicants for various programmes for the 2017/2018 Sandwich Session commencing on 21st July, 2018. A four-member team of lecturers and students from the Department of Graphic Design attended a three day animation festival dubbed Animafrik Festival at the Goethe Institute in Accra from May 31, 2018 to June 2, 2018. The University of Education, Winneba wishes to welcome our cherished Sandwich (freshers and continuing) students to the 2017/2018 Sandwich Session. As part of the University experience, you have opportunities for academic and personal growth, and we will offer the needed support to enable you navigate your way through this exciting journey of learning and discovery.